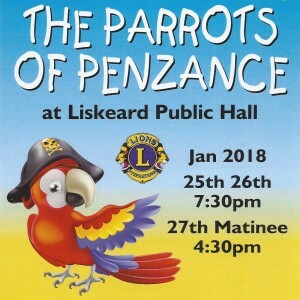 This year’s ever popular Liskeard Lions pantomime at the Public Hall will be the Parrots of Penzance. Tickets are available free for pensioners for the Thursday and Friday performances, inclusive of a pasty, cake and a cuppa. Doors open at 6.30 pm and the performance starts at 7.30 pm. The Lions club also transports many of our pensioners that are housebound or in residential/nursing care homes.To arrange transport for individuals or groups please call Lion Mike Higman on 01579 320417. Those individuals designated as requiring transport will have their seats allocated. All others will please register and collect tickets at Liskeard Museum. This year the Saturday performance is a matinee at 4.30pm. Tickets are at a cost of £7/£5 for adults and £5/£3 for children. A bar is available on the Saturday. 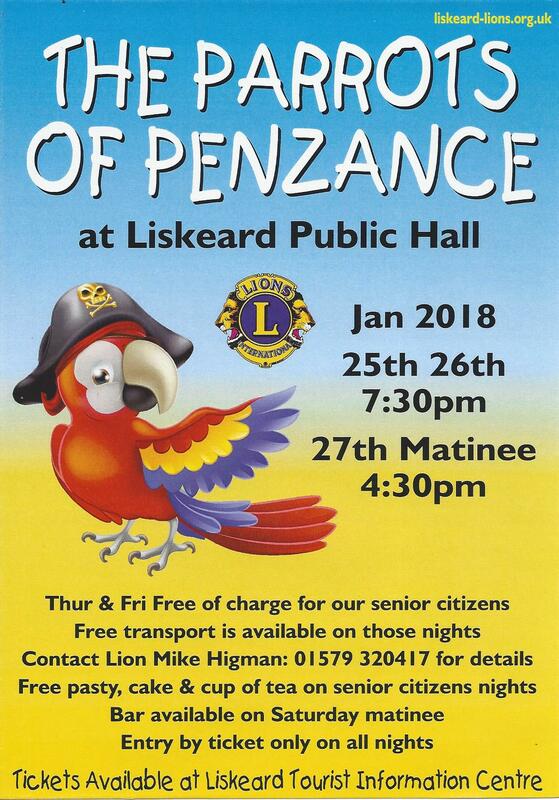 All tickets are available at Liskeard Museum from January 8th. If any spare tickets are available for the public for the Thursday and Friday performances they can be purchased from Monday 22nd January.